Global Canopy is an innovative environmental organisation that targets the market forces destroying tropical forests. 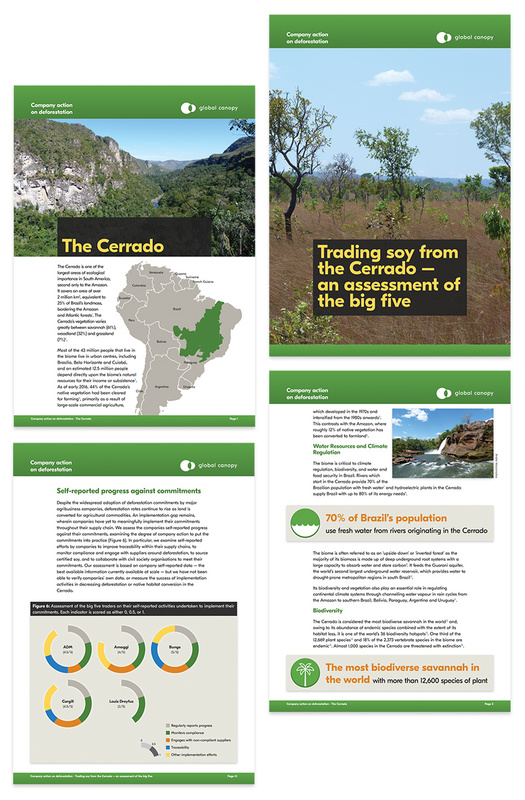 As part of their 'Company action on deforestation' research project, they created a series of reports and briefing documents to explain the research, the outcomes, and their recommendations based on findings. I was asked to design this series of documents, to give them a coherent and consistent look and feel, in line with the Global Canopy branding. This included using and extending a style of icons used through their materials, as well as interpreting data to create infographics. The aim was to ensure the data and information was easily and enjoyably readable, and had a visual style that ties in with the project website.